I Have the Charger Power! One of the best things about the iPad is its battery life. Even the most frugal of notebooks doesn’t match up to the 10 to 11-hour lifespan of a iPad battery charge. Apple has decided that this battery life target should remain consistent across models, only the actual size and capacity of the battery changes. That’s why we have the waif-like iPad Air 2. New components have become so power efficient that you don’t need a huge battery to hit the 10-hour mark. It’s also the reason the iPad 3 was such a porker. Now, ten hours is a great battery life for a tablet and for most people that’s enough, but what if you are going to be out of reach of a wall socket for more than 10 hours? There are lots of situations where this might happen. It could be a long flight or bus trip. Maybe you are at a conference and people are hogging all the sockets. Whatever the reason, a portable power bank provides a highly affordable way to keep your iPad (and other devices!) juiced when you can’t make it to the wall. They are surprisingly cheap, they are light, and they don’t take up much space. So chuck one or two (or three!) in your bag and be assured that you’ll be watching videos or browsing the web for many, many hours. Unfortunately, being such a low-priced product, the market is flooded with junk. So I’ve taken a few of the most popular power bank models to see what they offer and what the general consensus is concerning their quality. My top picks are listed first and the rest follow in no particular order. 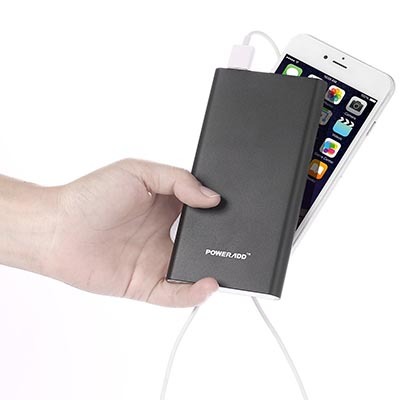 This power bank has enough juice to take an iPad Air 2 from empty to full once, adding 10 to 11 hours onto your tablet. The best part of this battery is definitely the size. It is exactly the same size as Anker’s previous 10,000 mAh bank, which was already compact compared to the competition. The PowerCore 13000 certainly puts a lot of electronics into a very small space. It has the same auto-sensing, fast-charging systems as other products from Anker, as well as all the safety systems that should prevent an unfortunate fiery end to your quest for power. Anker also provides a blanket 18-month warranty on all of its products. Apparently this bank is also compatible with the 12” MacBook from 2015 if you bring your USB-C cable. Pretty cool that you can charge a laptop with a power bank. I think that the hefty capacity combined with the professional look and heap of features make this a very compelling product. In fact it’s going on my wish list right now. I really like the two-tone color scheme of the RAVPower. Also, it has a built-in flashlight. Hey, you may laugh, but I’ve had a power bank with this feature before and it is really useful in a pinch. The RAVPower can spit out a combined 4.5A, which they say is the highest number in the industry. The capacity is decent, but will still only net you one iPad Air recharge. This seems like a very nice product and matches my top pick almost beat for beat, but with a higher capacity and a flashlight. 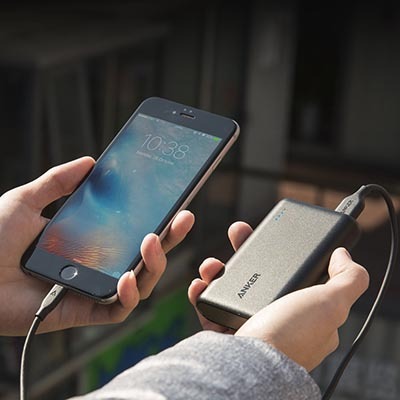 The problem is that the extra capacity doesn’t seem to provide much in the way of additional real-world charge and the RAVPower is significantly more expensive. So I would personally go for the Anker, but this is a strong second place. OK, so this is “store brand” stuff and we have no real way of knowing what Amazon had re-branded to make this product. What I do know about AmazonBasics products is that they usually provide a nice balance between quality and price. Hopefully this is another example of that philosophy. I’m lumping the 5600, 10000, 16100 mAh models together because they are identical in every way apart from capacity. At about 30 bucks the 16100 mAh represents a rock-bottom price for that sort of capacity. Unless you are really in a position where 10 bucks makes a difference, you might as well go for the biggest capacity version since the price difference is negligible. This power bank has all the features I expect to see as a minimum. There are two charge ports, LED indicator lights, overload protection, and a 12-month “limited” warranty from Amazon. This power output is rated at 3.4A combined and, of course, one port is 1A and the other is 2.4A. Everyone seems to be happy with these at the price, and at least returning stuff to Amazon is easy. While the quality is OK, the price is really good. So stock up while you can! Holy moly, 20,000 mAh is a lot of capacity. That’s the first thing I thought to myself when I saw this power bank. Anker seems to be doing everything right as well. It has two charge ports and outputs 4.8A at 5V. Jeepers. That’s two full iPad Mini charges from empty an almost as many for an iPad Air. Although it is not listed, I suspect the iPad Air 2 with its smaller battery would also get about two charges from empty. 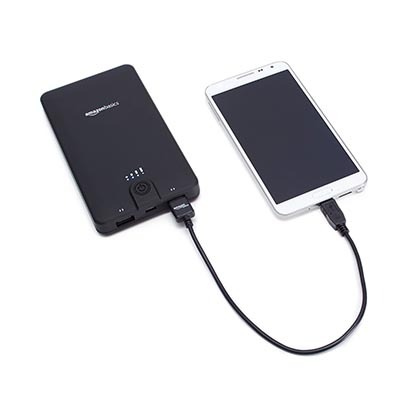 This power bank has intelligent voltage supply, so it should charge your device as quickly as it will safely accept power while taking the cable’s resistance into account. All from a device that weighs as much as a can of soda, but won’t rot your teeth or give you diabetes. The list of safety features is as long as my arm and covers just about everything that could go wrong with a power bank, short of being dropped into a fire. Anker also gives a blanket 18-month warranty on all of its products. 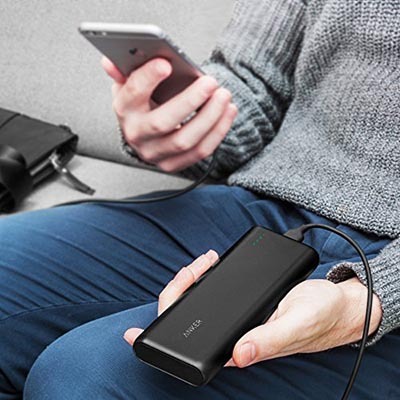 While it’s normal for the true power capacity of a power bank to be 10 to even 20 percent less than advertised, it does seems that when it comes to the iPad Air specifically, this power bank exhibits less efficiency than usual. It’s not clear if this issue persists with the Air 2. Still, even with the slightly lower comparative efficiency for the iPad, the PowerCore still represents a lot of spare capacity for a good price in a stylish package with lots of bells and whistles. I’d still buy it. Personally the 5200mAh power bank capacity is my favorite. I carry a similar bank of this rating with me in my messenger bag specifically to use with my Air 2. This capacity provides about 70%, or basically another 7 hours of charge. I like this capacity level because at the moment it provides the perfect balance between tiny size and usable power capacities. This Astro E1 pushes that notion hard, marketed as being “candy bar” sized. That’s no joke, this little guy measures 3.8×1.7×1.9 inches. So try not to lose it. 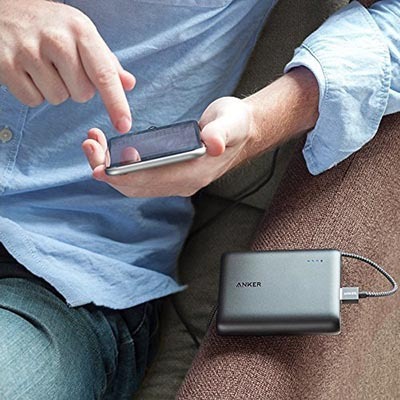 Other than that it has all the good stuff we’ve come to expect from Anker. This includes an 18-month warranty, their really cool PowerIQ technology, and, of course, fast 2A charging. It’s a little pricey compared to other similar banks, but I think it’s worth it. This powerbank from Poweradd has a very nice aluminum body, a welcome change from the plastic casings that we’ve all become used to. It doesn’t seem to have affected the price much either, since this is still in the same ballpark as other 10,000 mAh banks that I’ve seen. This choice of casing material means you can get it in some really nice color choices besides boring old black. There’s gold, rose gold, and silver; the metallic finish really is very appealing. If you use a 2.1 amp charger this bank will also charge faster than other products of a similar capacity. There are two power outputs: one 1A and one 2.1A and yes, you can use both at once. The high output port is color-coded blue so that there is no confusion. Just remember that the TOTAL output is 2.1A. If you want that for a single device, just plug something into the blue part. There’s enough juice in this bank to theoretically charge an iPad one to one and half times. If you think about that, you get an additional 15 hours on top of the 10 hours of a full charge. This is great, but in real life I’d think it would be closer, or even a little under, one full charge. I can’t seem to find whether the mAh figure is at 3.7 or 5 volts, but if (as usual) it’s at 3.7V then the actual mAh capacity is probably only equal to one iPad Air 2 charge. There are no integrated cables, which is great. Just use your own cables and charge anything. The best part however has to be the 24-month warranty. You rarely see battery warranties longer than 6 months, even for an expensive notebook, so this is quite a show of confidence. Unfortunately, you may have to make use of that warranty, as I see multiple buyers complaining of malfunctions and heat issues. It seems these are in the minority, but maybe look at other banks first unless you absolutely must have 2.1A charging. 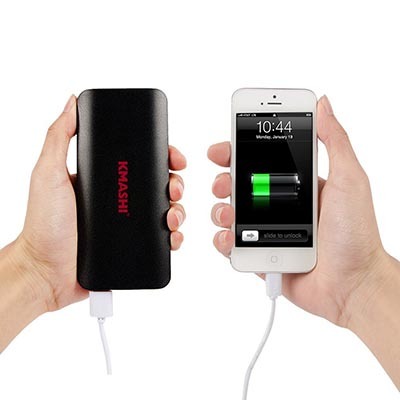 I’d never heard of KMASHI, but the red and black styling of this power bank immediately caught my eye. In fact, this is one of the best looking power banks I’ve seen. Just be sure to order the right color since it also comes in plain black, which is not as enticing – at least to me. KMASHI likes to point out that this is a compact product, but from where I’m standing it looks to be about the same size as other products in this capacity range. In fact it is physically bigger than the 13,000 mAh battery that I chose as my top pick. Users report that you can’t quite get a full charge for an iPad from it, which is unexpected for a 10k mAh bank. It’s well priced, though, and there seems to be nothing wrong with it in terms of functionality. So if you are OK with only 1-ish charge and dig the color scheme, you could do a lot worse. 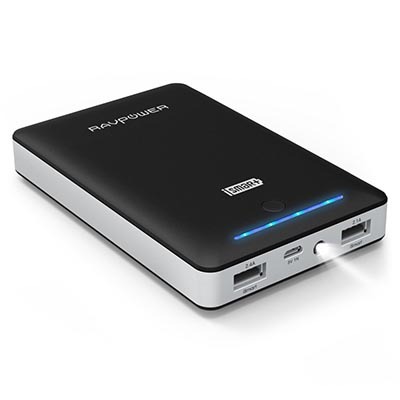 And here comes the KMASHI’s bane in the form of the PowerCore 10,000 mAh ultra compact. As I said in the KMASHI review above, even the 13,000 mAh PowerCore is smaller. 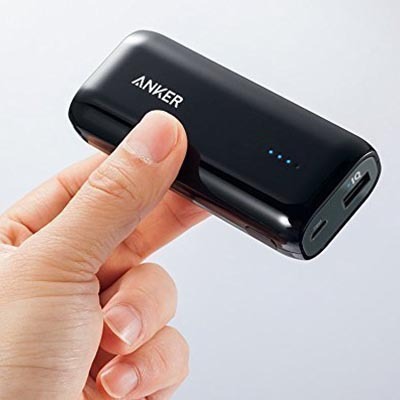 Anker just proved me right with their tiny 10K model we see here. It’s FOUR ounces lighter than the KMASHI and nearly HALF its length and width, while coming with all the same features as my top pick power bank. The only reason this is not featured up there is because 10K mAh is just not enough for a full iPad charge, but I’m definitely willing to swap this for my current 5200 mAh range extender, since they are about the same size. A really great product. Well, there you have it. A set of (mostly) good power banks that will keep your Angry Birds binge going far longer than can possibly be healthy. If none of these guys appeal to you, feel free to check out the power bank buyer’s guide that I put together(LINK). Between these reviews and that guide you should soon have exactly the power bank you need.